I've long been fascinated with fusion culinary, blending food styles, a mingling of previously divided worlds which when thrown together, undergo a sea of change into something peculiar yet comforting. However, I realized that this blog haven't really dealt with a lot of restaurants adapting to this wave. Case in point, Ninyo Fusion Cuisine and Mr. Kurosawa, are just some of the restaurants still unticked on my bucket list. 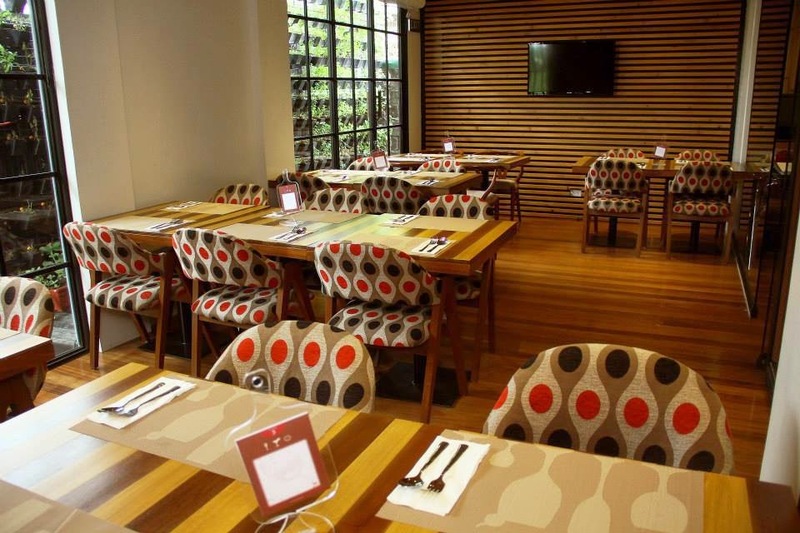 More recently, fusion restaurants are embracing the formula to give their diners a totally unparalleled experience. That said, I could never refuse an invitation from a fellow foodie at the newest restaurant in Kapitolyo, Pasig, the Red Panda Bistro. 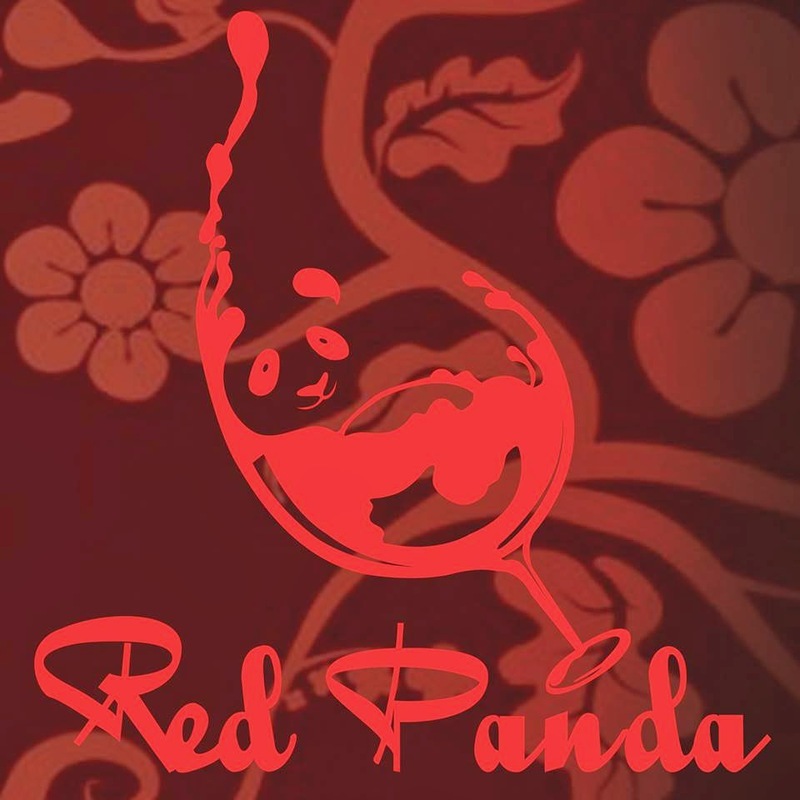 Red Panda gives you a taste from both sides of the world and is heavily inspired by both European and Chinese Cuisine. The invitation however was for an event in which chef representatives of Disciples of Escoffier Philippine Delegation will be cooking up a storm not only to show what they are capable of but to raise funds to support them in their culinary endeavour. Spanky, was kind enough to have me and some other blogger friends to join in a remarkable gustatory adventure. 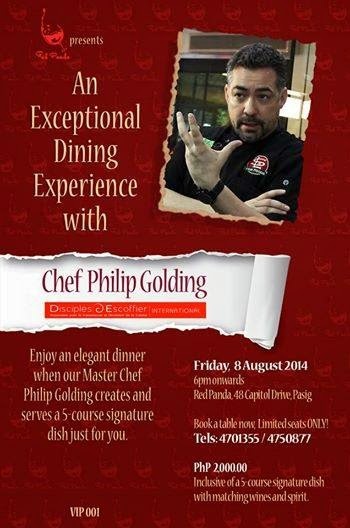 I was glad to know that the event will be featuring one of the best ex-pat chefs I personally know. Chef Philip Golding, CEO of Golding Culinary Group and also the president of Disciples d'Escoffier Philippines (DDE), is the managing director of the Eat and Cheat Cancer Book Project where I volunteered to work with. Being their food editor, I've seen how Chef Philip worked, with it is the passion and the pure love for culinary. So, without a doubt, I'm sure this event would level with or even top out some of the dining events we had during our EACC high time. If you are wondering what Eat and Cheat Cancer is all about, kindly visit our Facebook page at this link. Before I go on and tell you the nitty-gritty of the event, let me set the stage first and share a bit of how Red Panda looks like. With the east meets west concept in tow, the owners have also integrated the restaurant's design into it, both in the facade and the interior. The French inspired furniture and other French country elements are matched with Oriental sliding glass doors offering a refreshing sight of the ornamental bamboo plants, while the vertical herb garden surrounding the restaurant is a pleasant modern, eco-friendly add on. Before you get at the end of the venue, this glass encased kitchen will excite and astound you as you see the action before you. Red Panda Bistro have partnered with SnL/Brera Delicatessen to make sure cheese and deli connoisseurs are well-entertained. Behind the open kitchen is the stairs leading to the private dining rooms at the second floor. At its best, this dining destination for both dim sum and pasta lovers will definitely feel that east meets west vibe. The bistro has created a host of 90 plus dishes from freshly made noodles to baked breads loaded with deli meats, sprightly greens and to mention their marvelous variety of wines and teas, under close supervision of Chef Philip Golding and Red Panda's Executive Chef, Chef Donnah Magallanes Elizalde. This truly involves thrillingly unexpected combinations. To marry the concept of a Chinese/European fusion, Red Panda invited Master Chef Philip Golding for an exclusive dining experience for a limited number of guests last August 8 held in Red Panda Bistro. It was a sumptuous evening of sumptuously prepared dishes – inclusive of wine pairing provided by Manny O wines. The evening was hosted by Eiffelene Salvador of Disciples of Escoffier Philippine Delegation supported by her young and very talented team. Chef Philip Golding, Chef Donnah and Chef Marie-Rhae H. Salazar or "Mara"
Thanks to Manny O wines for pairing our lovely five-course dinner with their wine selections. Here are now what I braved the traffic for on a Friday night. We began with Truffle Cheese Veal Dumpling. Finely minced veal, mushrooms and spring onions are lightly seasoned with spices and truffles. My eyes lit up at the sight of this cute steamy dimsum elegantly topped with a lacy thin sheet of cheese crust, with a stalk of a spring onion rested on it. Our dinner actually started and ended with some wine samplings, and I began with some sips of sparkling white wines, then followed by red wine -Manny O’s Discipulus Syrah Wine, paired with the appetizer. Before even finishing my second glass of wine, a plate of deli composed of cured and smoked meats, calamata olives, slices of preserved onions and caperberries. Unlike capers, if you are familiar with it (usually in Pasta Puttanesca), caperberries are less acidic, and are milder than lemons. This gave out a distinct contrast to the highly salty charcuterie (pronounced as s̸här ko̵̅o̅t′ə rē′) and the blue cheese it was topped with. When I saw the tray full of what seemed to be soups, as our next course, I slowly rested my fork on the table and waited patiently for mine. Comforting is not an enough word to describe the Roasted Tomato and Red Capsicum Soup. It's a viscous soup from the smooth pureed roasted tomatoes and capsicum with a dollop of home-made mild cream on the middle. It's like Yin and Yang captured in a soup bowl and presented as one. After having tasted three dishes, I knew we'd be in for more treats. Grilled Salmon was up next! A medium-sized chunk was perfectly pan-grilled, together with the shrimp, which were then laid on a bed of sauteed red cabbage, in sultana and soya dressing. After having observed most of the plates in our table, the red cabbage has not won any commendations, with its bitter aftertaste. However, the fish and shrimps rendered a moist and juicy mouth-feel with the sultanas and tarragon adding some subtle sweetness, while the soya dressing giving that Asian flare. A good take on that Euro-Asian cuisine they were trying to achieve. I thought I was done for the night, for I was feeling full on my tummy, but kept adept to how the dessert would flatter us. Then Effieline would again call our attention as the the main entree was about to be served. It was Pan-Seared Australian Rump Steak with mushroom garlic risotto, crisp water cabbage, and oyster red wine sauce. In all honesty, I could never really gorge myself on big servings of steaks. I grew up eating a matchbox-size of pork and beef meats, and more than one would be an indulgence, it was for some health reasons I have acquired till now. Thus, you can call it cheating if you have to spot me on some buffets with some lavish steaks and roasts. This too would not be an exception. But don't get me wrong, though I was not able to finish a perfect 10 grilled Aussie rump, I would say, steak-lovers like Jane of Between Bites can attest to its goodness. Our meat had that utterly moist pinkish center, as what the chefs would have always suggested, then topped with crisp garlic flakes for that extra kick. Mine has two stacked on handful of mushroom garlic risotto and sauteed water cabbage. While the others dipped their steaks on the oyster red wine sauce, I have all of it poured over the whole dish. Now on my mind, are two things: one - how to start my next day with my exercise mat and some You Tube clips on how to burn those damn fats I got from this dinner, two - how the Apricot Ginger Creme Brulee would take its form. I once had apricot and ginger-flavored tea, I could also recall having eaten them dried and candied. but as a flavoring for creme brulee? Nah! So, it was such a surprise having them all in one dessert. A French dessert given a Chinese twist, from the timeless vanilla flavored dessert, the team Escoffier had given it a make-over, with the a note of apricot ending with a gingery after-taste. It looked gorgeous with the crystallized sugar adorning individual cups and that sesame "lengua de gato" piece just spelled y-u-m.
Lastly, had this dessert with Manny O’s Sumiller Red Wine. So you now know, how Red Panda have lured me with their take on fusion gastronomy. This is just an unveiling of what the Bistro have painstakingly made their menu with, having inter-married the best of both worlds. Not to mention that the food are priced reasonably with classic favorites given delish tweaks.